oil on canvas, 16 x20"
Works by William and Lucy L'Engle are held and exhibited within the nations most esteemed arts institutions, and were actively sought and displayed in contemporary venues during their active careers. 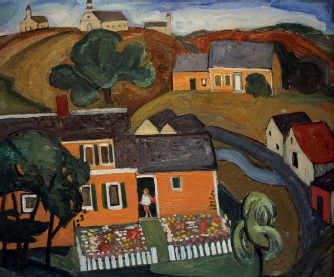 Both artists are closely associated with the modernist faction of the Provincetown Art Association, which included progressives such as BJO Nordfelt, Karl Knaths, Gerrit Beneker, Blanche Lazzell, and Agnes Weinrich. 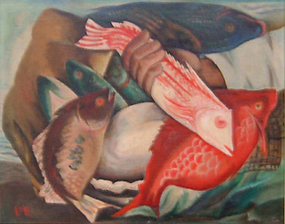 Lucy first joined and exhibited at The Provincetown Art Association in 1918, and in 1921, she served on first Modern jury at the Association. William served on the Modern Jury in 1925. The L'Engles maintained a life long affiliation with PAAM. In the '20s and '30s, the philosophical wars being waged throughout the art world were also fought within the Association. Its artist founders had come out of the Impressionist tradition, and although a variety of styles had been represented in members’ exhibitions since the inception, PAAM’s "establishment" did not readily incorporate the modernist movement. Faced with aesthetic differences among its artist membership, PAAM maintained a balance. True to its mission, the organization represented both sides of the artistic argument, mounting separate "Modern" and "Regular" summer exhibitions between 1927 and 1937. Still, the conciliation reached in 1937 was only partialinstead of separate exhibitions, separate juries installed concurrent exhibitions on opposite gallery walls; a coin-flip determined that the modernists' work hung on the left. Throughout this period, much of the artistic argument took place in forums and discussions organized at PAAM by one side or the other. PAAM continues it's dynamic membership opportunities, exhibitions, and educational outreach.